March 14, 2017, 1:38 p.m. The company’s strategy of attracting a younger audience and tying them into their suite of services is paying dividends and laying down a marker to its rivals. Over the past few years, the worlds of mobile, broadband, landline and TV have converged into a homogenous mass – the quadplay market. While BT is making much of the running at the moment, Sky is also starting to make a move, which highlights the challenge to the established order of things. While the threat is felt in all four sectors, it is especially evident in mobile. Traditionally dominated by “Big Four” MNOs – Vodafone, EE, O2 and Three, the rise of SIM-only use (increasing from 6% to 26% over the past five years) has led to an increase in consumers not being locked into lengthy contracts and able to switch much more. This has contributed to MVNOs representing 30% of the installed base (up from 16% in 2010). It is within this context that BT is really starting to shake things up. While the drift away from MNOs has been a long-term one – over the past 12 months the move towards MVNOs has increased in intensity. In March 2016, 44% of those that had switched network over the previous 12 months changed to an MVNO, by December it was 52%. 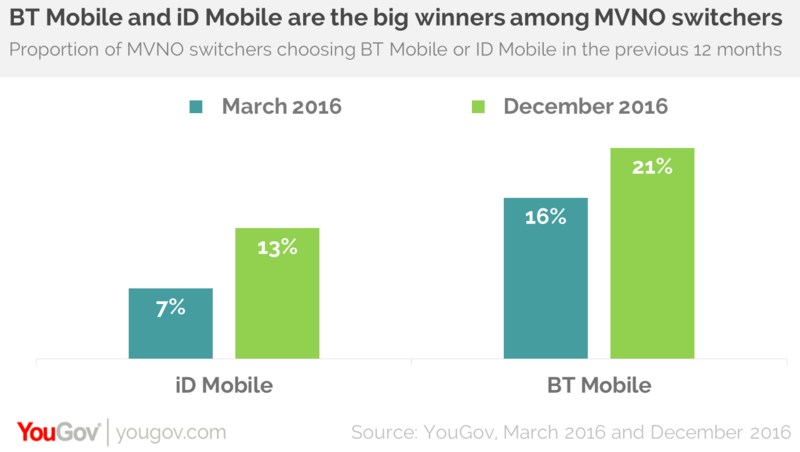 BT and iD Mobile have been the biggest winners in this recent shift. Among MVNO switchers in the past 12 months, BT has increased its share by a third (from 16% to 21%), while iD has improved from 7% to 13%. A further challenge to the “Big Four” MNOs comes from Sky – its recent mobile launch allowing it to finally push a quadplay offering. But at present, it is BT that is stealing a march on its rivals when it comes to mobile and broadband. Its campaign in the SIMO market – where BT broadband customers receive £5 off their bill when they sign up for BT Mobile – is resonating with its customers. Almost nine in ten (87%) of those who have switched to BT Mobile in the last 12 months also have BT Broadband. Of these, two thirds (68%) have a SIM-only deal. It is also likely to increase further. Over a third (35%) of BT and Sky customers looking to add services to their broadband package expect to include mobile in their bundle. Given the MNOs have few bundling options while the likes of Sky, BT, Virgin and TalkTalk do, it seems likely that the MVNOs’ share of the mobile market will strengthen further in the coming years. A linked reason for BT to be optimistic is its successful shaping of millennials’ perceptions of the brand. Approaching a quarter (24%) of BT’s current broadband customers are millennials. 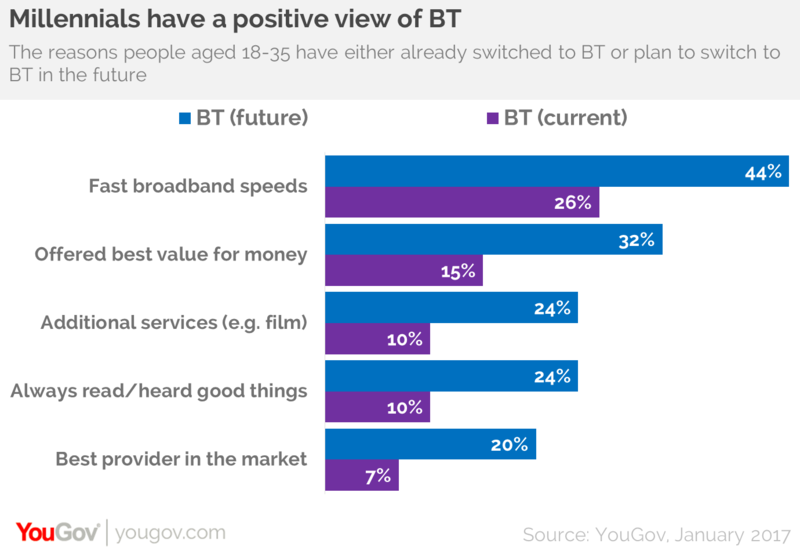 Their main reasons for these customers choosing BT are fast broadband speeds (26%), value for money (15%), and additional services such as content or mobile (10%). Interestingly, 10% chose BT because they had always read or heard good things about them. The numbers are even more impressive among future customers who are under-35. Over four in ten (44%) say they would choose it due to its broadband speed, a third (32%) because of value for money and a quarter (24%) for its additional services such as content or mobile. Impressively, almost one in four (24%) would choose BT because they always read about or hear about the brand. 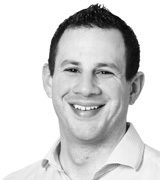 BT successfully executing its strategy – both in general and among millennials – should be ringing alarm bells among the traditional mobile and broadband providers. However, with Sky expanding its role within the sector, BT should not get too complacent as the hunter can soon become the hunted as we have seen over the past six or seven years in the telecoms space.